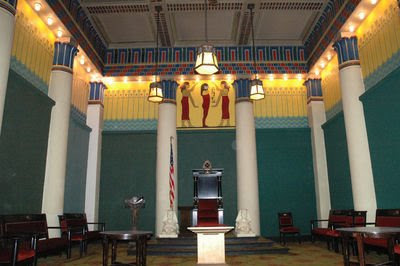 I am honored to again be serving on the Indianapolis Masonic Temple Board this year, so it was nice to see Indiana Freemasons' Hall's Egyptian-themed Red Cross Room mentioned in a recent article in the January/February 2009 Indiana Preservationist, the official magazine of the Indiana Historic Landmarks Foundation. The article, "Architecture Reflects fever for All Things Egyptian" by Paige E. Wassel, discusses the influence of Egyptian motifs on American architecture dating back to Napoleon's military campaign in Egypt in 1798-99, and some of the more notable examples in Indiana. Indianapolis architects Rubush and Hunter designed at least three buildings with Egyptian details that survive in the city: The Madame Walker Theater, the magnificent art deco Circle Tower, and of course our own Freemasons' Hall. While our building doesn't have overt Egyptian details on its exterior, the Red Cross Room is certainly loaded with them. Read the incredible story of the rediscovery of the long-lost works of the Greek mathematician Archimedes, a 2,200 year-old papyrus scroll, hidden under the ink of a 700 year old prayer book. The manuscript of "The method" is now the earliest known work on calculus. "A Prayer For Archimedes" in Science News. On Saturday, March 28th, the Grand Lodge of Massachusetts will hold a statewide Masonic open house. 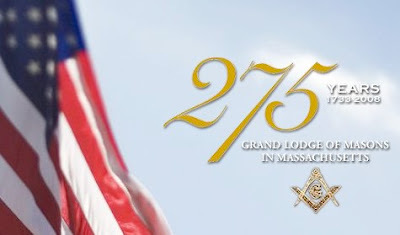 More than 150 Masonic buildings across the state will be open from 9am to 3 pm sharing information about the fraternity, and celebrating 275 years of Freemasonry in Massachusetts. I think these are terrific events, and I wish more grand lodges would promote them. It's a great way to connect with the local community and once a year remind the neighbors that there is still a Masonic lodge in town that's thriving and open for business. It also generates far better visibility across the state than one single lodge can hope to do. No, I am not about "demystifying" the fraternity. I AM about teaching our communities about who we are, what we stand for, and why a 21st century man should consider becoming a Freemason. We've fallen out of the habit and collective memory of society. We need to get that back. This is a good way to start. As we get down to the end of January, just a final reminder of The Masonic Society's First Annual Gathering on February 13th, 2009 during Masonic Week in Alexandria. Tickets are available ONLY by mail, and ONLY by February 1st. Follow the link for more information. I hope to see you in Alexandria! There is nothing good in this story. 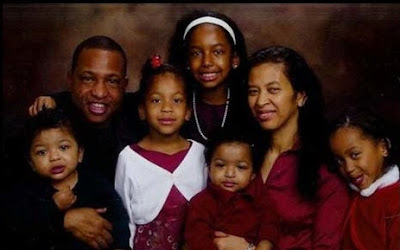 There is nothing but sorrow and loss, and the tragedy of a man who felt so alone—in his church, his union, and apparently even in his fraternity—that he truly believed the most unspeakable act was the only answer to his family's problems. And that his wife seemed to agree. "[Ervin Lupoe] was not a member of a Masonic lodge belonging to our Grand Lodge or of any lodge that we are aware of. . . Many Masonic rituals, and some that purport to be Masonic, are widely available in print and on the Internet. These are not the ritual of the Grand Lodge of Masons of California nor, to the best of our knowledge, the ritual of any Grand Lodge in this country today. Phrases found in these publications have been used in ceremonies of non-Masonic organizations for centuries." The Grand Master of California, Larry L. Adamson, is asking that media and public inquiries be directed to Terry Mendez, Director of Communications, at tmendez @ freemason.org. According to an article in the Houston Chronicle on Saturday, the Shriners Hospital for Children in Galveston will be closing, a victim of the economic downturn. Employees were told last Thursday that the 42 year old facility would be shutting its doors indefinitely. "Administrators told employees at the end of the meeting to go home and not return until a 1 p.m. Monday meeting with Shriners International President and CEO Ralph Semb. “This sounds like a lockout, but it’s not,” hospital administrator John Swartwout Jr. told employees, a remark met by groans and muttering. Swartwout said the Shriners board decided Jan. 16 to suspend hospital operations as an emergency measure to shore up its finances. . . Semb told the Houston Chronicle on Tuesday that hospital operations were suspended because the national economic downturn had decreased the Shriners endowment, which has shrunk from about $9 billion to $5 billion. The decline reduced interest payments from the endowment, which finances the 22 Shriners hospitals, Semb said." The Shriners' website reports that the Galveston Hospital has already been closed for renovation since Hurricane Ike caused major damage to the facility last September, and children needing care have been sent to other Shriners Hospitals. The site goes on to say that, because of the current economy, the Shriners Hospitals for Children, which provides pediatric care at no charge, "is currently facing the most tumultuous and trying economic environment in its 86-year history." A belated congratulations to the brethren and officers of my mother lodge, Broad Ripple Lodge No. 643. I continue to be so proud of this lodge I could bust. I'll be speaking to the Grand Lodge of Alaska between Tuesday 2/3 and Thursday 2/5, at the kind invitation of Most Worshipful Brother Jared Decker, Grand Master. This year's grand lodge session will be held on Kodiak Island, at the Best Western Kodiak Inn. Just in case you're in the neighborhood. Flights to Kodiak are challenging from the midwest, and I am very grateful to GM Decker for all of the trouble it has taken to arrange my passage to their session. 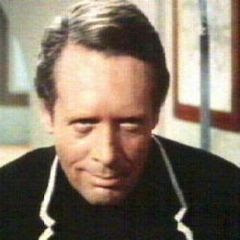 More astonishing, he has actually heard me speak before, and still wants me to come up! Perfect Union #10 Lodge Banquet to be held at Incarnate Word Stanley and Sandra Rosenberg Sky Room. Social Hour: 6:00 - 7:00 PM (Cash Bar Available), Dinner at 7:00 PM. Garden salad, Rib eye Steak, Garlic Mashed Potatoes, Green Bean Almandine, Iced tea, Coffee & Water, Dessert - Double chocolate fudge cake with fresh whipped cream and strawberries. 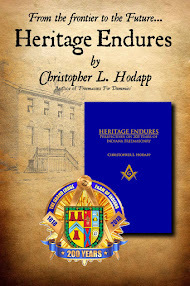 Speaker: Christopher Hodapp, author of "Freemasons For Dummies", "Solomon's Builders: Freemasons, Founding Fathers, and The Secrets of Washington D.C."
Cost $5.00 per person Lodge Members, family, and friends. You may pay at the door; but, Please RSVP to Bro. Tom Young at (210) 525-1828 no later than January 28, 2009. Boxes of Issue #2 of The Journal of The Masonic Society just landed like a largish avalanche on my doorstep today, and the mailing service got them at the tail end of last week, so they should be hitting mailboxes now. Working on Issue #3 now which will go to the printer by the end of February for a March delivery, so please remember to keep articles, notable news events and photos coming. Thanks to all who have contributed, and to our advertisers, for helping to make The Journal the most unique Masonic magazine anywhere. Lodge Vitruvian No. 767's January Quarterly Feast in Indianapolis is lining up to be one of our most memorable evenings each year. 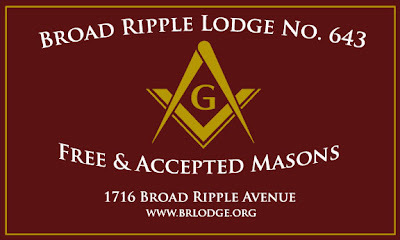 Tuesday, January 27th, we will meet for our brief Stated Meeting at 7:00PM at the Temple of Broad Ripple Lodge #643. 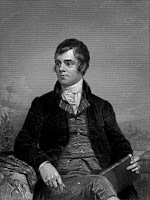 Following the meeting, we will adjourn to the Corner Wine Bar in Broad Ripple at approximately 8 PM where we will be celebrating the 250th birthday of Scotland's - and Freemasonry's - poet laureate, Robert Burns. Dinner will be the traditional Burns' Night fare of beef and tatties. Our ladies are cheerfully invited to attend, as we will be making the traditional Toast to the Lassies (and, of course, receiving the Return Toast to the Laddies). Those wishing to join in the reading of the Bard of Scotland's prose need only bring along their favorite Burns poem. Bawdy songs and Scottish tales are joyously welcomed, as long as they are recounted in your most bilious Scots burr. The price of dinner is $25 per person. A cash bar will also be available. Brethren with proper knees for the wearing of the kilt are welcome to do so for the evening. 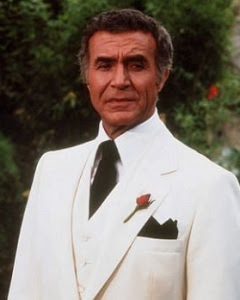 Otherwise, proper dress for Vitruvian members is tuxedo, and either tuxedo or business attire for visitors. 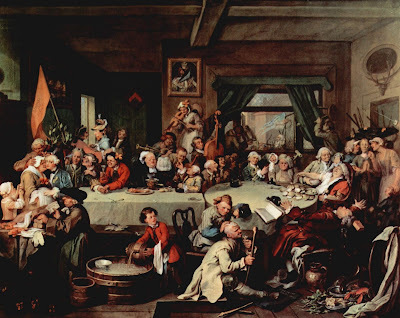 Those unable to be with us are asked to remember your brethren, wherever you may be, at the stroke of 9:00 PM, when the clock forms the fourth part of a circle, and drink a toast to us, as we shall to you. Ours Burns night has been cited by its attendees as the most fun they've ever had at a Masonic function. Don't miss it! Clausen, who is best known for the Vendome Firefighters Memorial in Boston, unveiled his Prince Hall design last week at Cambridge City Hall. It is to be placed on Cambridge Common where Hall, a freed slave, met with General George Washington in 1775 and urged him to recruit African-Americans for the Continental Army. 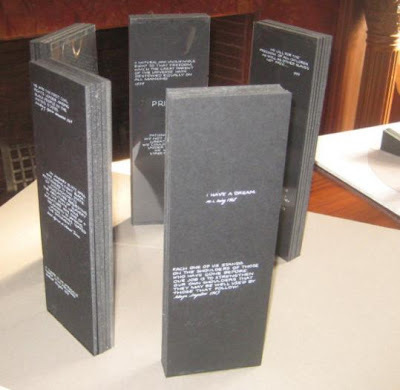 To illustrate that concept, Clausen has designed a circle of 6-foot-tall black slabs. Facing outward will be quotations from civil rights leaders, including the Rev. Martin Luther King Jr. On the inside surfaces will be quotes from Hall himself. The monument project reflects Mayor E. Denise Simmons's longstanding interest in Prince Hall. Echoing Clausen at the City Hall ceremony, she said, "Martin Luther King stood on the shoulders of Prince Hall." Nothing Masonic about this post, but we lost not one, but two iconic gentlemen today. Both men have escaped their respective islands at last. Thanks for the memories. For seventeen years, Michigan's Bonisteel Masonic Library has published a regular magazine called "Rising Point," and it is a true labor of love from its editors Michael Ozog and Karl Grube. The Winter 2009 issue is available online now, and is completely made up of reprinted articles about the building of the Detroit Masonic Temple. At its most basic level, Freemasonry teaches civility and tolerance for for our fellow men, and is a platform upon which its members may meet upon the level, hopefully without the divisions that exist among men outside of the lodge. To that end, the brethren of Gate City lodge No. 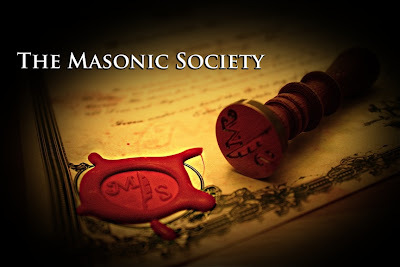 2 in Atlanta have instituted a public program of which Masons across the country and the world should take careful note. This from Brother David Herman about Gate City Lodge No. 2 and its 2009 lecture series on religion and culture. Atlanta's Gate City No. 2 is taking a bold step forward this year by inviting all brethren, their families, and the general public to hear a series of speakers on a variety of religions and cultures. For meal planning purposes, attendees are asked to to RSVP to rsvp@gatecity2.org. On Tuesday, January 27, the topic will be Saivite Hinduism. Representatives from the Kashi Atlanta Ashram will give a presentation on the Hindu religion, culture and history, and will speak about some of the Ashram’s Interfaith work. Dinner will be Chicken Tikka Masala and Palak Panner (both traditional Indian dishes) and is $7.00. On Tuesday, February 24, the topic will be Classic Islamic Poetry. J.D. Jordan, an educator who recently completed a graduate degree in US-Middle Eastern History, will present a program which looks at the Classical period of Islamic Poetry. The most common themes of the genre will be explored from Middle Eastern Devotional Works to familiar romantic styles, tavern poems and satires. The purpose of the program is to demystify an often-adversarial culture through verse and historical perspective. The meal will be Shish Kabob and is $7.00. Future topics and bookings will include eclectic Shamanism, the Catholic Church, and more. Expect dates to be on the fourth Tuesdays when they occur; the information will be announced here when released. Presented at the Atlanta Masonic Center at 7:30pm, following a $7.00 dinner at 6:30pm, various dates. This from WBro. Mark Tabbert at the George Washington Masonic National Memorial in Alexandria, Virginia. This is a truly useful program. The goal is to eventually digitize all proceedings of all US Grand Lodges into a searchable database—a boon to researchers and future generations, as well as a space-saving way to be rid of reams of duplicated copies of proceedings that take up untold miles of shelf space in grand lodge libraries and basements where they reside, unindexed, unused, and virtually inaccessible. Yes, the initial digitalization may be costly, but it is a worthy goal, and the memorial is the one national location and body that all mainstream grand lodges participate in and support. 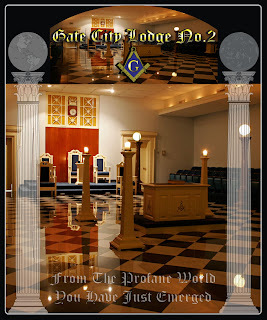 The program is well worth looking into for your grand lodge. EDIT: Broken links now fixed. My fault, not Mark's. The George Washington Masonic Memorial Association, in partnership with OCLC, is offering to all interested Freemasons two web sessions (15 & 29 January) to learn about ContentDM Database. Currently contained in the database are over 100 years of Grand Lodge of Washington State's Proceedings, seven years from the Grand Lodge of Oklahoma and 93 years of the George Washington Masonic Memorial Association annual reports. The Masonic digitization project is open to all members of the Memorial Association and to all other Masonic organizations. 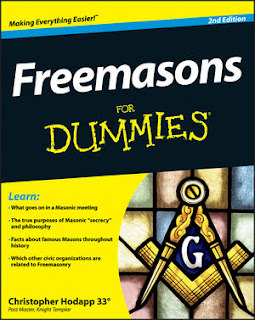 Any participating Grand Lodge may first periodically determine the number of volumes it wishes to digitize. In response the Memorial and OCLC determines the cost of the volumes, and upon approval, ships the volumes to OCLC’s processing center. Within in a matter of weeks the digitized proceedings are available to the Grand Lodge through a private and secure website. Once the process is complete, the Grand Lodge will receive a master archive copy of their proceedings in TIFF format. The base cost for this process will be $0.69 per page, plus $6.95 to dis-bind each volume. For example a hard-bound proceeding of 1,000 pages would cost $696.50. With ContentDM the Memorial Association is uniquely placed to coordinate the voluntary and systematic digitization of American Masonic history. Though this service Freemasons may better communicate among themselves, educate the brethren and articulate their history, aims and achievements to the digital world. - please forward to any interested Freemason. Founded in 1967, OCLC is a nonprofit, membership, computer library service and research organization. More than 69,000 libraries and other cultural heritage organizations around the world use OCLC services to locate, acquire, catalog, lend and preserve library materials. OCLC’s CONTENTdm® Digital Collection Management Software provides a complete solution for Grand Lodges to store, manage and deliver their digital collections to the Internet. CONTENTdm’s text-based search engine is designed to retrieve results from millions of items no matter the format—books, newspapers, maps, audio/video and more. Flexible for collection building. CONTENTdm gives Grand Lodges full control over digital resources, their descriptions, access and display. It stores any type of file and displays all items viewable in a Web browser. Active user community. Through CONTENTdm, Freemasonry become part of an active user community that is advancing efforts to digitize primary resources by sharing best practices and putting millions of items on the Web. Libraries’ and other cultural organizations’ successful digital projects have received community recognition, provided leadership, support genealogy research, and access to historical information. Banquet Cost is $65 per person. All members, friends, and ladies are most welcome. IMPORTANT NOTICE: We are honored to be an official participant in the Allied Masonic Degrees "Masonic Week" program. Tickets for the banquet are available ONLY in advance through the AMD Week organizers. All meals MUST have a ticket. ALL RESERVATIONS must be made by FEBRUARY 1st, 2009. No meal tickets will be sold at the hotel! So I awoke this morning to get ready to go downtown for Alice's installation ceremony in the Social Order of the Beauceant, and the news greets me that it's minus 78 degrees in Alaska. This does matter to me, really it does. I will be traveling to San Antonio, Texas to speak to the brethren of Perfect Union Lodge No. 10 on January 31st, at the University of the Incarnate Word, Stanley and Sandra Rosenberg Sky Room. I'm truly looking forward to this event. 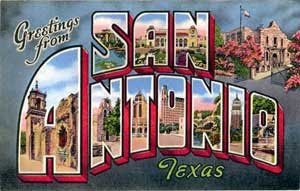 I have always loved San Antonio, and this will be my first Masonic trip to Texas. Hopefully, I'll store up a little excess body warmth. 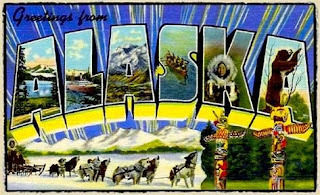 because I fly home on February 1st, and then on the 2nd, I head for Kodiak, Alaska for the annual communication of the Grand Lodge of Alaska. After that, it's off to Masonic Week in Alexandria, Virginia, and the premiere First Circle gathering and Banquet for the Masonic Society. Our guest speaker will be the renowned Yasha Beresiner from London. EDIT: My friend Russ Spice in Detroit reminds me of the scariest fact of all: "Did you think about the fact that at -78 degrees, it could rise up by a whopping 109 degrees, and water would still be in solid form?" MW:. Glen A. Cook, Grand Master of Masons in Utah, has announced that Sentinel Lodge No. 4707, of Stockport, England will demonstrate the Fellow Craft degree using Britain's Emulation Ritual at the Annual Communication of the Grand Lodge of Utah on Friday, January 30th, at 1:15. That evening Alex Beaton will be in concert at the Masonic Auditorium in Salt Lake City. I had the extreme pleasure of being invited to speak to the brethren of Wasatch Lodge No. 1 in Salt Lake City last year, and made many new friendships there. If you have the opportunity, go visit their magnificent building, and see this special presentation. Emulation is very different from the Preston/Webb/Morris ritual worked in most US Masonic jurisdictions. 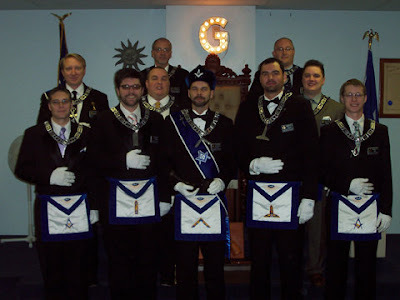 Sentinel Lodge No. 4707 presented the EA degree last year at the GLofU's annual communication—not surprising, since Glen travels between the US and the UK on a regular basis (he also has a home in Scotland), and served as the Worshipful Master of that lodge in 2006-7. In September, 2007, he was invested with the rank of Past Provincial Junior Grand Warden for the Province of Cheshire, United Grand Lodge of England. Congratulations to Grand Master Cook on an outstanding year as Grand Master. He has much to be proud of.